Jennifer Batten’s Tribal Rage - Momentum” CD was a labour of love which was developed over a period of several years. “Momentum” is a hybrid of rock and very exotic sounds, including African percussion, Australian didgeridoo, Caribbean steel drums. 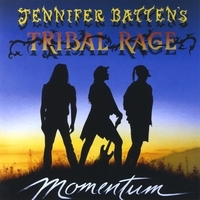 “Jennifer Batten’s Tribal Rage - Momentum” CD was a labour of love which was developed over a period of several years. “Momentum” is a hybrid of rock and very exotic sounds, including African percussion, Australian didgeridoo, Caribbean steel drums and Scottish bag pipes all wrapped up in a inviting album of diverse influences and sounds. Looking back on the album’s creation Jennifer comments, “Glen Sobel, Ricky Wolking and I set out to make this a rich sonic journey for ourselves and the listener. We wanted to take them around the globe and included a lot of elements from different cultures. We spent a lot of hours developing, rehearsing and jamming in Glen\'s mother’s shoe closet. You couldn’t fit more than the 3 of us and our equipment in there, but the price was right. We set out to be as open minded and creative as possible”. Shortly after the release of Jennifer’s debut “Above, Below & Beyond” in the spring of \'92, she was asked again to join Michael Jackson for his upcoming \"Dangerous Tour\". In January \'93, she joined Jackson to partake in Superbowl XXVII\'s half time entertainment which aired to one and half billion people in 80 nations. It was the largest audience in television history. She completed her second solo record \"Jennifer Batten\'s Tribal Rage ~ Momentum\" just before she was again asked to join Jackson for his 2 year world tour supporting his double album \"HIStory\" in 1997. Jennifer\'s Tribal Rage project took a much different direction than her first record and is heavily influenced by world music. In the spring of 98 Jeff Beck asked Jennifer to join his band. They joined forces for 3 years on the CD’s \"Who Else\", and “You Had It Coming” which were both supported by world tours.